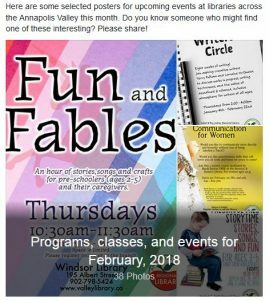 Did you know that the Annapolis Valley Regional Library has a newsletter? It’s true. Once a month we send out updates on events, contests, upcoming happenings, staff picks for books, and more. It is easy to sign up, and it arrives directly into your email for FREE! Find the link to sign up right at the bottom of this page, or click HERE. There are other ways to find out what’s happening at your local library, and to share your library adventures with friends and family. We’ve got a Facebook page, which we’d be happy if you “like” and participate with. We share lots of photos there, as well as upcoming event posters and fun library and book-related news. We make it easy for you to let others know about our events: just click on the poster event and share with your friends! We run contests on Facebook as well, so follow us to win books, t-shirts, and who knows what else. Do you Instagram? Did you know we do too? Follow us for #BookfaceFriday, pictu res from our library events, and the occasional insider look at how libraries work. We love it when you tag us on Instagram, and show us your view of our libraries, what you are reading, and our t-shirts out in the wild. Use @avrlibrary or hashtag #AVRLfun and show us how you love the library. How about Twitter? We are there too! 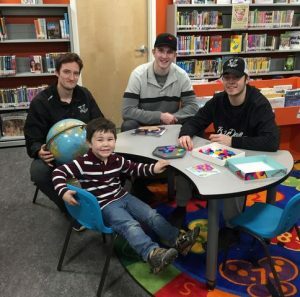 On Twitter we follow lots of other libraries, authors, and booksellers, and share information from the library world, from around Nova Scotia, and updates on programs, events, and weather cancellations. We like to follow you, too, to know what’s going on in the Valley, so if you Tweet, give us a follow and say hello! We are @valleylibs. And of course, you can always come visit us IRL. We have 11 convenient locations plus our roving library on wheels (otherwise known as the Bookmobile). Our website is open 24/7, and there you can always find hours, locations, events, and our online resources such as Chilton’s and Tutor.Com. You can even check out eBooks, magazines, and audiobooks anytime you have access to WiFi. And speaking of WiFi, we have that too. We’ve tried to make it easy for you to find us and follow us. Stop by and say hello, online or in person!